How to Grow Dracaena Deremensis indoors or in the garden. 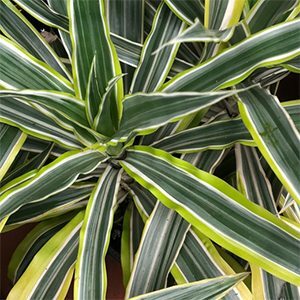 Widely grown as an indoor plant D. deremensis is increasingly popular, especially the varieties with strong variegated foliage. As an indoor plant it is tough, it will cope with low light and dryish soils, however it does look better in good filtered light. Grown indoors as a specimen plant or as a background plant to flowering indoor plants, mark this as ‘easy care’. Try a position in good filtered light where the foliage will be at its best. When watering, always allow the soil to dry a little between waterings. Avoid positions in cold drafts, and try to keep the humidity up a little. Sit the pot on top of a saucer with pebbles in it, and fill the saucer with water, this will help with humidity. Used a normal free draining potting mix. Fertilise with a slow release type balance fertiliser in spring. Water well before fertilising and immediately after. Leaves turning brown. – Usually caused by low humidity. Root rot – Caused by poor drainage, overwatering or old potting soil. Easy from cuttings which will usually strike well in normal potting mix. You can do this if you decide to prune the plant to lower its height. Remove a new shoot that is around 10 cm long and simply plant it. Keep moist for a few weeks until growth is evident. You can also take a stem cutting without leaves, take a 5 – 8 cm section, and place it in water in a low light area that is warm. Change the water every two days. Is this plant poisonous to cats ? The answer is yes, all Draceana are poisonous to cats.